A few weeks ago, I made these Stuffed S’mores Protein Cookie Balls and totes fell in love with their graham cracker cookie shell. It’s soft and buttery, but it’s firm enough to hold everything together. Being the pizza lover that I am, I immediately started thinking of how I could turn it into a dessert pizza of some kind. A chocolate pizza will likely come in the near future but for now, I give you a refreshing, high protein fruit pizza. 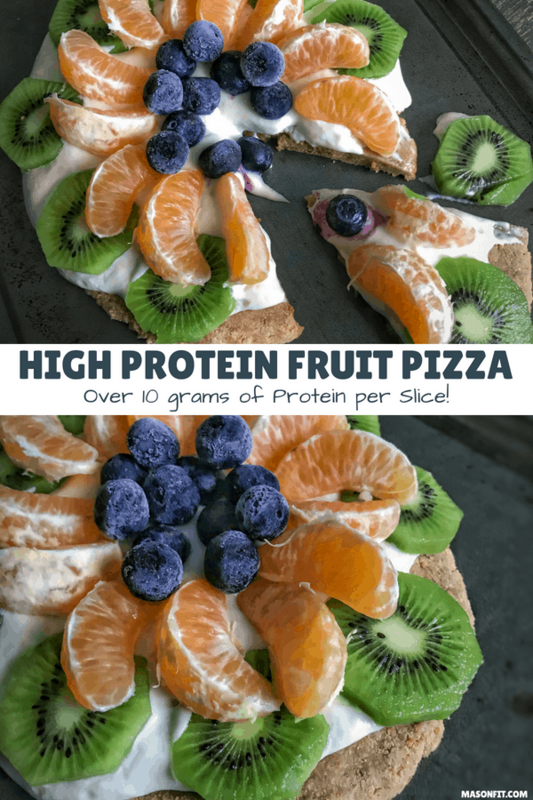 Each slice of this fruit pizza has around 11 grams of protein, 18 grams of carbs, and 4 grams of fat. Those numbers will obviously change depending on the fruit you choose, but the protein and fat numbers are pretty constant. I’ll take a 3:1 protein to fat ratio every day of the week! Like I mentioned above, your fruit pizza dough will be made of graham crackers and only three other ingredients. Since I typically blog about higher protein recipes here, one of the other three ingredients will be protein powder. You can use any protein powder you’d like, but I always like to answer the question in advance by saying I use Dymatize 100% Whey or Optimum Nutrition Gold Standard Whey in 99% of my recipes. Other powders work fine in most cases, though you may need to slightly tweak liquid ingredients if the consistency or texture of recipes gives you trouble. That said, this fruit pizza dough is an easy one that should work with just about anything you throw at it. Beyond the protein powder, you’ll need a sticky sweetener. I love using Walden Farms Pancake Syrup since it has zero calories, but honey or another sugar-free syrup would work fine. And finally, the topping for this fruit pizza calls for vanilla Greek yogurt. If you like the flavor combo of plain Greek yogurt and fruit, go with plain instead of vanilla. This is your fruit pizza, not mine! As you can tell from the photos, I used kiwi, Cuties, and blueberries. You can use any fruit combo that you want on this fruit pizza, though. If I could time travel, I would swap the Cuties for strawberries or another berry. The Cuties are fine, and the citrus works really well the crust and Greek yogurt topping. I just love strawberries but didn’t have any on hand. 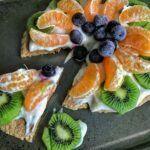 Some of the more popular fruit pizza toppings are kiwi, blueberries, strawberries, pineapple, oranges of some kind, raspberries, blackberries, and grapes. Basically any fruit that can be easily cut into bite-sized pieces and doesn’t contain too much moisture works well. 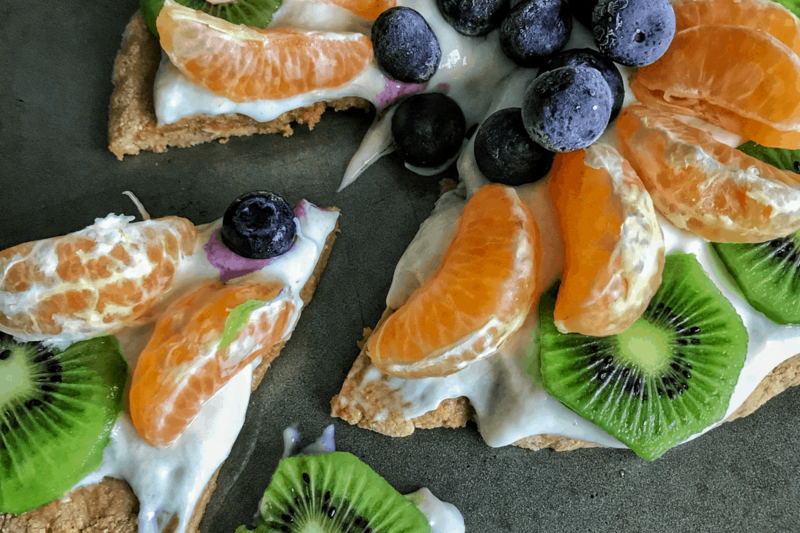 A 4-ingredient graham cracker pizza crust topped with a Greek yogurt topping and fresh fruit. Preheat an oven to 350F and spray a baking sheet or pizza pan with nonstick cooking spray. Set aside. Mix all the fruit pizza dough ingredients in a large bowl until you can form a large ball of dough. Use your hands if necessary. Transfer the dough to the baking sheet and use your hands or the backside of a spatula to flatten the dough into a large circle. Bake the dough for 5-6 minutes or until the center is no longer gooey and the bottom of the dough is fully cooked. Be careful not to overcook as the dough will become slightly chewy/tough. While the dough is in the oven, mix the Greek yogurt and protein powder in a bowl and prepare the fruit you'll be using. Allow the dough to cool for a few minutes before adding the Greek yogurt topping and fruit. Cut the fruit pizza into 6 slices and serve, or you can refrigerate/freeze to fully cool. Refrigerate leftovers. You can swap the WF syrup for any sticky sweetener like honey or another sugar-free pancake syrup. Plain Greek yogurt is fine if you like plain Greek yogurt with fruit instead of vanilla. You can also use plain and sweeten it yourself. 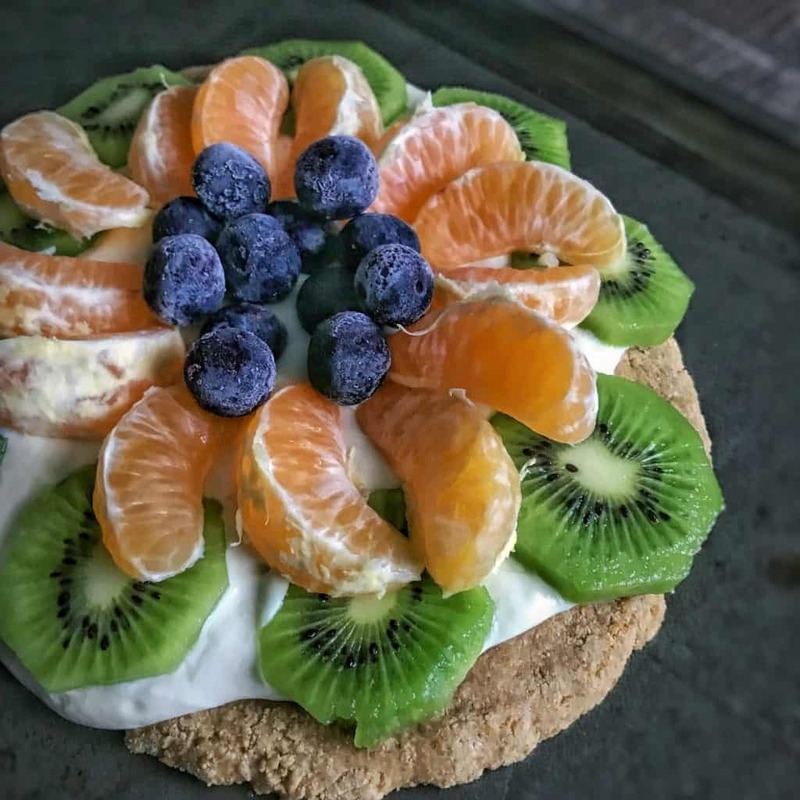 Alternative fruit pizza toppings include: kiwi, blueberries, strawberries, pineapple, oranges of some kind, raspberries, blackberries, and grapes. Basically any fruit that can be easily cut into bite-sized pieces and doesn't contain too much moisture works well. To make mini personal-sized pizzas, just follow the instructions for my s'mores cookie balls and add the Greek yogurt and fruit toppings accordingly. If you make this recipe, I’d love to see it on Instagram. Be sure to tag me and I’ll share your re-creation with the world! And in case you’re a dessert hound like myself, check out my free high protein cookbook for chocolate lovers. Inside, you’ll find nearly 30 of my most popular high protein chocolate packed recipes. You can simply enter your info in the form below and I’ll send a copy straight to your inbox. I love this fruit pizza! I actually made it into a flag for 4th of July and everyone went crazy for it. I make it for breakfast often and it’s so delicious!